Tenable.io® Container Security seamlessly and securely enables DevOps processes by providing visibility into the security of container images – including vulnerabilities, malware and policy violations – through integration with the build process. DevOps teams are turning to Docker to quickly build and release new services and applications. Containers, however, present significant security challenges and risks. The short-lived nature of containers, lack of IP addressability and credentialed scanning, and inability to remediate vulnerabilities in production mean securing containers requires a different approach. 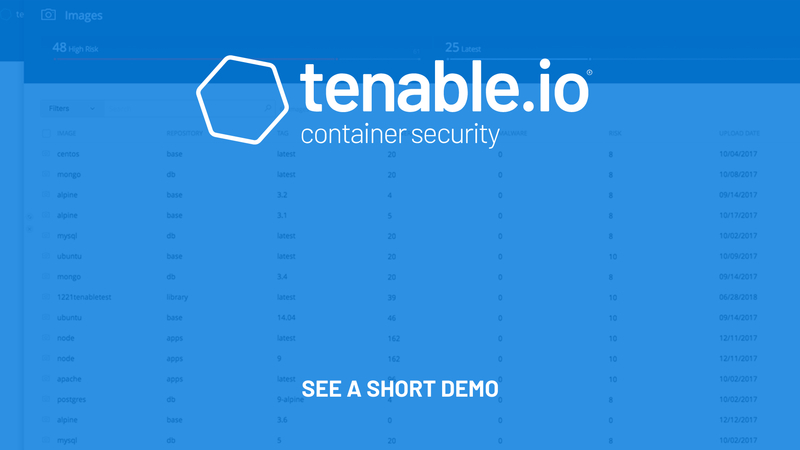 Tenable.io Container Security delivers end-to-end visibility of Docker container images, providing vulnerability assessment, malware detection and policy enforcement across the SDLC - from development through operations. By integrating with developer build systems, Tenable.io Container Security brings proactive visibility to solve the security challenges of containers at the speed of DevOps. “Shift left” with security in the software development lifecycle. Perform rapid vulnerability and malware detection within the DevOps toolchain, using integrations with the leading CI/CD build systems and container image registries. Know what is inside a container before and after deployment. See a detailed bill of materials covering all layers and components. Gain “at-a-glance” visibility into container image inventory, runtime operations and security. Perform rapid and automated assessment of container images by layer. Use a specialized malware detection engine to ensure images are malware-free. Apply unique layer hierarchy intelligence to understand when vulnerabilities are mitigated in higher layers. Protect containers from newly identified threats via monitoring of a wide range of external vulnerability databases. Container images are automatically re-tested as new vulnerabilities are identified so you can rapidly respond to emerging risks. Ensure containers in production are compliant with policy. Notify developers immediately with specific remediation advice when container images exceed risk thresholds - in development and in operations. Address new cyber risks that emerge after deployment. Automatically identify and test running containers that have not yet been assessed. Be notified immediately when containers are modified during runtime. Identify and fix vulnerabilities before deployment to save significant time and reduce complexity. Gain peace of mind with comprehensive insight into the security of your containers. Pinpoint security risks and take direct action with specific remediation advice. Push secure code even faster with security testing inside your CI/CD toolchain. Tailored dashboards for each DevOps team provides immediate security alerts. Measure Cyber Exposure and benchmark against peers.